Hip Hop Thursday with Unity Stamp Co. is here! of them here today, along with a couple of stamps from different Kits of the Month. I'm breaking the mold today and going with a couple of tags instead of cards. manila tag would look just right with a lily white egg sitting on top! cardstock, which I trimmed out and attached with foam dots. 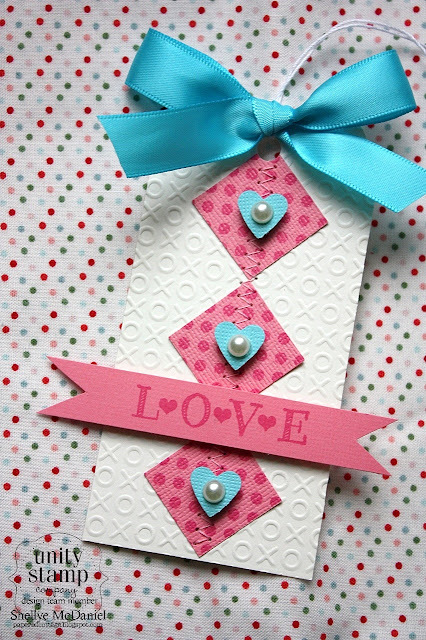 Lots of possibilities with the Stripes.Dots.Hearts Faux Quilted Stamps! I used a zig-zag stitch from my sewing machine to keep them in place. Next I stamped "LOVE" from the January Kit-of-the-Month. one of THREE $20 Unity Gift Certificates. Good Luck...thanks for visiting my blog! Your tags are so fabulous ...love them!! gorgeous tags Shellye!! Always so inspirational popping over here!!! Wonderful tags! I especially like the quilt blocks. Beautiful tags! LOVE the layers and details!!! I love how 3D you made the tag! Your tags are beautiful! I especially loved the egg one!! just Gorgeous! Beauriful tags! I really love the quilted one! I may have to taglift and make a card using this design. Beautiful Easter & Val tags. You showcased these stamps well. Your tags are terrific. The good egg tag is so creative. Love the colors you used on these tags....Wonderful. Fun tags! I like them both. Great ideas, thanks for sharing. Your Good Egg tag is so speial. Yes yes yes I like your good egg!!!! These are great, I am especially loving that egg tag! Love the sparkle and that sweet little button! Very creative work. The tags are fabulous. Super cute cards, thanks for sharing your ideas! Great tags Shellye! 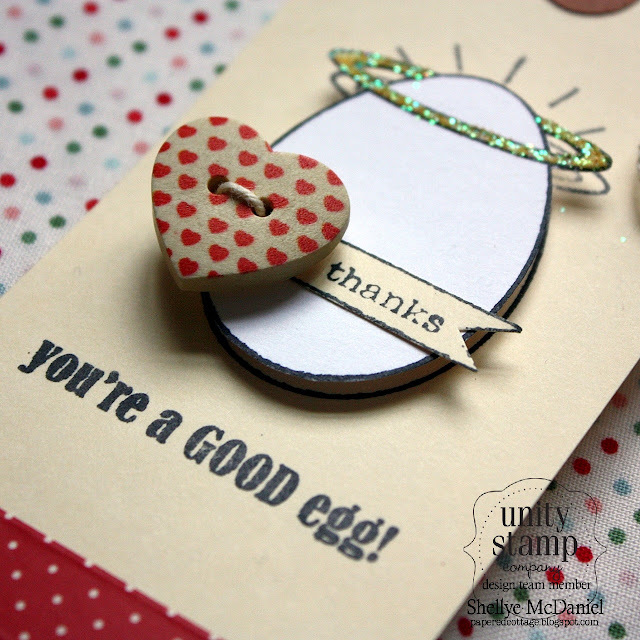 I love the egg stamp on the first tag, and that lovely texture from the stitching and embossing on your second tag! Love your tags. They are both awesome. AWESOME tags! That egg stamp is too cute. Wow! These are gorgeous tags! TFS! I love these adorable tags!!!! Both tags are great! Love the XOX Background. LOve the tags!! The egg is super cool! so much fun, love the popped out egg, but I do love the colors of the second one! Such fun tags, love them! Such a cute tag, great stamp! Love the incredible egg! Too cute! Aww....what a cute idea to use them on tags! These are so adorable! Great tags! Love the egg one! Beautiful creations! I love the glitter on the halo! These area adorable tags, Shellye. Love the heart button on the first tag! I love tags and those are so cute. Thanks for sharing and giving me some great ideas. 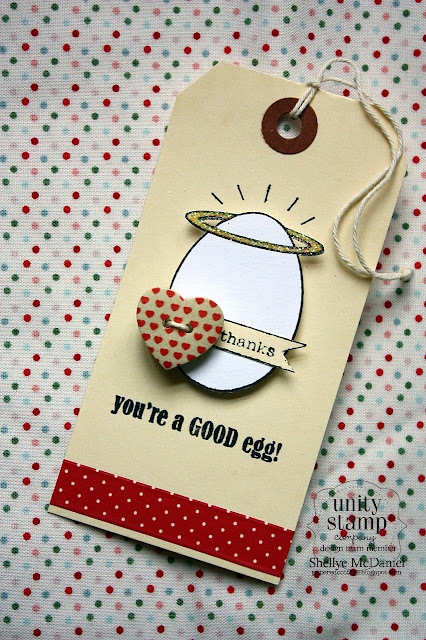 The egg tag is very cute and I really enjoyed the quilted card! Like you tags esp. the egg. TFS. Wow, these tags are so yummy. Love all the little details! Love both of your tags. The good egg is so cute and the other is pretty with the embossed background. Lovely tags. Thanks for sharing. Your tags are awesome. 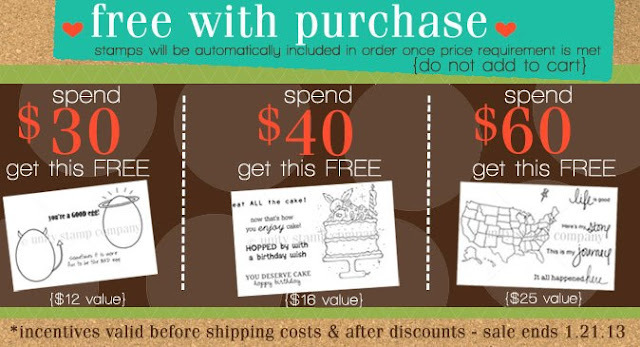 Really fun ways to convey a little love. Thanks for the inspiration! I love your tags. Makes me want to pull out mine.